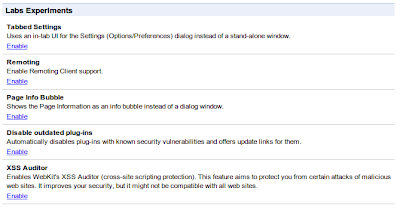 New Chromium Labs Feature Provides Protection Against XSS Attacks? Just going through the about:labs page in Chromium today, I found a new feature that instantly reminded me of Twitter exploit few days back where my tweets were retweeted automatically by some guy name Matsta. Many Twitter users became victim of this Cross Site Scripting (XSS) Attack. 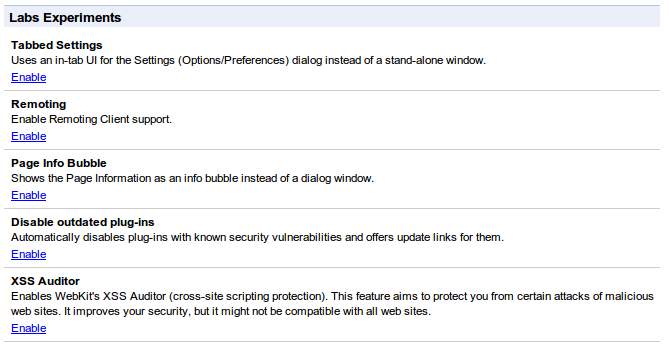 So, what's there in the new Chromium Lab Feature? A new feature has been introduced where users can enable Webkit's XSS Auditor that provides protection against XSS attacks. "Enables WebKit's XSS Auditor (cross-site scripting protection). This feature aims to protect you from certain attacks of malicious web sites. It improves your security, but it might not be compatible with all web sites." If you have already installed Chromium, you need to run first two commands only & install the new updates. Then type about:labs in your address bar and enable XSS Auditor from labs page.